Mirrorless ILC. Sony Alpha E-Mount 30mm f/3.5 Macro Lens. Boasting high contrast and minimal chromatic aberration from infinity on down to 1:1 magnification at all aperture settings, theSony Alpha E-Mount 30mm f/3.5 Macro Lens (30mm focal length, f/3.5 maximum aperture) ensures excellent image quality throughout the entire image area. 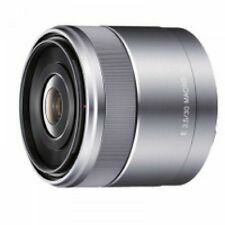 Sony E 30mm f/3.5 Macro Lens SEL30M35 (Silver) Excellent!! This lens is in perfect working and in excellent condition. 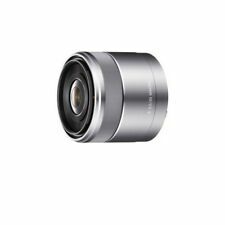 4.5 out of 5 stars - Sony E 30mm f/3.5 Macro Lens SEL30M35 (Silver) Excellent!! 33 product ratings33 product ratings - Sony E 30mm f/3.5 Macro Lens SEL30M35 (Silver) Excellent!! Sony SEL E 30mm f/3.5 Macro (SEL30M35). Front Lens Cap. Rear Lens Cap. Lens Weight Mount Material Our warranty covers labour costs for repairing the faulty unit. Exterior Finish 7 blades (Circular aperture). 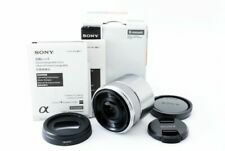 SONY SEL30M35 E 30mm F3.5 Macro Lens E-Mount [Exc ] #426005A. There is no haze on inside of the lens. Including Front Lens Cap. Rear Lens Cap. (But of course it does not affect the photos.). I will provide courteous and responsive service. E mount lens (for Sony mirrorless single lens) ?. Equal magnification macro lens exclusively for E mount that can be carried around easily in the world. Since the closest shooting distance is approx. Sony E 30mm F3.5 Macro E-mount Lens SEL30M35. Sony SEL E 30mm f/3.5 Macro (SEL30M35). Front Lens Cap. Rear Lens Cap. Lens Weight :4 7/8 oz (138g). AF for Movie Capture :Yes. Direct Manual Focus :Yes. Aperture Blade :7 blades (Circular aperture). E 30mm F3.5 Macro E-mount Lens SEL30M35. Sony SEL E 30mm f/3.5 Macro (SEL30M35). Front Lens Cap. Rear Lens Cap. Lens Weight Mount Material Our warranty covers labour costs for repairing the faulty unit. Trending at $258.66eBay determines this price through a machine learned model of the product's sale prices within the last 90 days. MPN: SEL30M35. Focal Length: 30mm. Series: Sony SEL. Product Line: Sony SEL. PRODUCT HIGHLIGHTS. In Holding in your local custom. Sony Alpha E-Mount 30mm f/3.5 Macro Lens with 3 UV/FLD/PL Filters with Cleaning Kit. Sony Alpha E-Mount 30mm f/3.5 Macro Lens. Sony Alpha E-Mount 30mm f/3.5 Macro Lens with Boasting high contrast and minimal chromatic aberration from infinity on down to 1:1 magnification at all aperture settings, theSony Alpha E-Mount 30mm f/3.5 Macro Lens (30mm focal length, f/3.5 maximum aperture) ensures excellent image quality throughout the entire image area. Sony Alpha E-Mount 30mm f/3.5 Macro Lens 3 UV/FLD/PL Filters Macro Tripod Cleaning Kit. Sony Alpha E-Mount 30mm f/3.5 Macro Lens. Sony Alpha E-Mount 30mm f/3.5 Macro Lens with Boasting high contrast and minimal chromatic aberration from infinity on down to 1:1 magnification at all aperture settings, theSony Alpha E-Mount 30mm f/3.5 Macro Lens (30mm focal length, f/3.5 maximum aperture) ensures excellent image quality throughout the entire image area. Sony Alpha E-Mount 30mm f/3.5 Macro Lens with Ring Light Macro Tripod 3 UV/CPL/ND8 Filters Kit. Sony Alpha E-Mount 30mm f/3.5 Macro Lens. Vidpro TT-22 22" Table Top 3-way Pan & Tilt Head Macro Tripod & Case. Sony Alpha E-Mount 30mm f/3.5 Macro Lens with Flash Soft Box Bounce Diffuser 3 UV/CPL/ND8 Filters Kit. Sony Alpha E-Mount 30mm f/3.5 Macro Lens. Sony Alpha E-Mount 30mm f/3.5 Macro Lens with. Sony Alpha E-Mount 30mm f/3.5 Macro Lens with 16GB Card NP-FW50 Battery 3 UV/FLD/PL Filters Tripod Cleaning Kit. Sony Alpha E-Mount 30mm f/3.5 Macro Lens. Sony Alpha E-Mount 30mm f/3.5 Macro Lens with. Sony Alpha E-Mount 30mm f/3.5 Macro Lens with NP-FW50 Battery 3 UV/FLD/PL Filters Macro Tripod Cleaning Kit. Sony Alpha E-Mount 30mm f/3.5 Macro Lens. Sony Alpha E-Mount 30mm f/3.5 Macro Lens with. Sony Alpha E-Mount 30mm f/3.5 Macro Lens. Sony Alpha E-Mount 30mm f/3.5 Macro Lens with Boasting high contrast and minimal chromatic aberration from infinity on down to 1:1 magnification at all aperture settings, theSony Alpha E-Mount 30mm f/3.5 Macro Lens (30mm focal length, f/3.5 maximum aperture) ensures excellent image quality throughout the entire image area. MPN: SEL30M35. Model: E 30mm F3.5 Macro. Compatible Mount: Sony E. 100% Authentic Genuine Products. (ex Russia). Lens Typemacro. (More than a month). It takes a while (depends on a country but about a month). I'm Japanese living in JAPAN. (It might be more than a month). I correspond from the bottom of my heart. Model: E 30mm F3.5 Macro, SEL30M35. Focal length: 30mm. Lens Mount: Sony E mount. Doing that is against U.S. and International laws. The color of the actual products may be slightly different from that of the images on this web site. Product model number SEL30M35. Equal magnification macro lens exclusively for E mount that can be easily carried with the world's lightest ( ). Since it approaches the subject to the shortest shooting distance of about 9.5 cm, it is useful for proximity shooting such as flowers and accessories. MPN : SEL30M35. Japan Usage Item. [ Electronics ]. [ Country of Manufacture ]. Japanese Warranty Only. [ Warranty ]. Blue Ray --- Region A or Free Region. Sony (SONY) SEL 30 M 35. Lens type Single focus lens. Lens mount Sony E. type Wide angle lens. Focal length (wide angle side) 30 mm. Asia, Middle East. Even if you think to yourself, "But the item I want is only available in Japan.". Â—† Built Lens Motor To Achieve A Quiet Af Driving Smooth, The Exterior Using An Aluminum Alloy. ・ SONY SEL30M35 E 30mm F3.5 Macro Lens for E mount. Model: SEL30M35. Focal length (mm): 30mm. Lens Mount: Sony E mount. - from the end of December to the beginning of January (around Dec 28 to Jan 6).